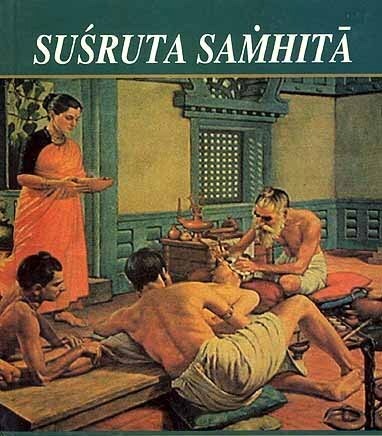 Sushrutha Samhita (सुश्रुतसंहिता) is a Sanskrit text on surgery, attributed to Sushruta, a physician who possibly resided in Varanasi around 6th century BCE. Susrutha-Salya-Tantra were composed about 6th century B.C. It has been revised by Nagarjuna in the later part of 4th century BCE. This text, along with the Charaka Samhita, is considered as foundational texts of Ayurveda (Indian traditional medicine). The text was translated to Arabic as Kitab-i-Susrud in the 8th century CE. The word Rhino came from Rhonoceros with large horn above its nose. There were a surprisingly large number of noses in India that needed to be reconstructed. Noses were considered symbols of pride, therefore they proved to be quite tempting targets during warfare. Besides the multiple damages to Indian noses as a result of warfare, other noses required surgical repair following the damage brought on by punishment for legal transgressions. Amputation of the nose was considered proper and just punishment for a multitude of offenses, including adultery.The roots of ancient Indian surgery go back to more than 4000 years ago.